Next post: What Does the Reedley Chamber of Commerce Do? For the past few years, I have been bringing my rats to work. 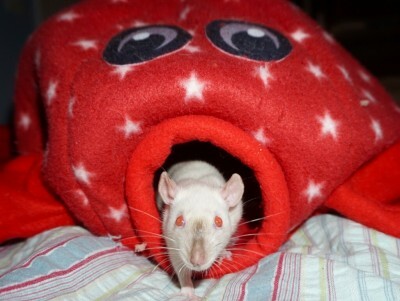 People know me as the rat lady and know that I work with Rattie Ratz to help find Bay Area ratties homes. I was traveling abroad a few weeks ago for a business trip and got an incredible message from my coworker, Kharisma. In the message, she explained that she arrived home from work to find a wild scene – a crow menacing and attempting to attack a very small rat. She took the rat in and put it in her bathtub with some towels and a box, since she didn’t have any kind of cage or carrier to set up. Fresh from her encounter with the crow, and already friendly and trusting. I was so relieved that the rat was safe, but I had one major concern. I asked my coworker to verify that the rat she found outside of her home was indeed a domesticated rat. Rattie Ratz cares about the welfare of all animals, but we are only able to take in and process domesticated, pet rats. Kharisma let me know that the rattie was very tame and calm and sent me a photo of an adorable little Himalayan girl sitting calmly in the palm of her hand: undoubtedly a pet rat who needed our help. 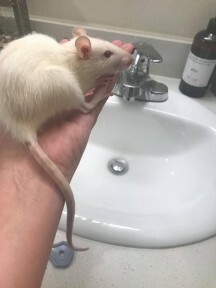 Even though I was an ocean away, I was able to quickly call on the Rattie Ratz community of volunteers to get someone to Kharisma’s house in Mountain View to pick up this lucky little one. Our long-time volunteer and intake coordinator, Diane, took her in for her 2-week quarantine period. During this time, she realized that this was a very special rat and sweet rat, who loved to be held and cuddled. She was exceptionally calm and affectionate, despite all that she went through, and being in a new environment. Despite being tempted to keep her, Diane knew that there was someone who needed her more. 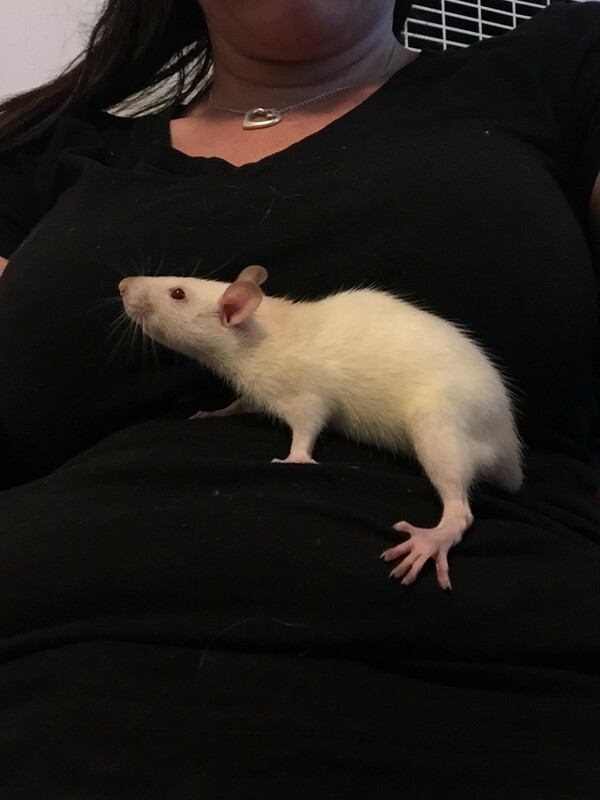 Jenny, another long-time volunteer, adopted another solo female rat through Rattie Ratz who loved to cuddle and lay in her hand. They enjoyed a close bond until she sadly passed away at only 1.5 years due to a pituitary tumor. 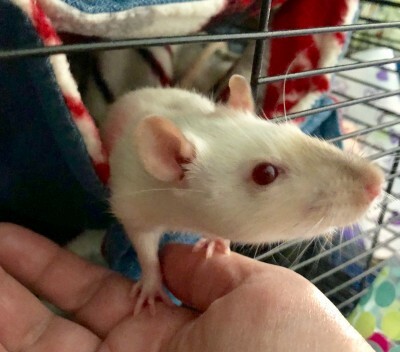 After that, Jenny asked Diane and our other intake volunteers to keep an eye out for another cuddly and kissy female rat who could fill the space in her heart left by her special rat’s passing. Jenny took the new rat in. She named her Raven, after the miraculous experience that she survived on her way to her new home and they formed a bond right away. Raven was remarkably calm, especially for a young, female rat, which are usually very active and less likely to stick around to be petted. Since arriving at her new home, Raven has been having fun exploring and being more active. She likes to be tickled by her mom, running away and then immediately running back for more tickles. Once she’s tuckered out from exploring, she returns to Jenny for more cuddles and kisses. Raven’s story will be hard to top as one of our all-time favorites from Rattie Ratz rescues. We couldn’t wait to share the remarkable personality and unbelievable story of this very special rattie. Jenny and Raven finding each other is the start to a beautiful relationship, and one of the reasons why we love the work we do with these amazing animals. Thanks for sharing the happily ever after.